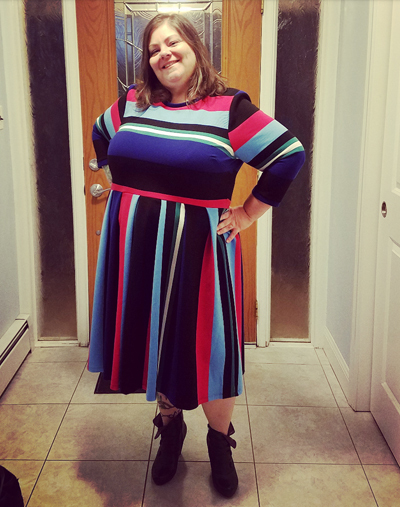 In one of my selfies from the past two weeks, I was wearing Eloquii's Opposing Striped Knit Dress, which has quickly become one of my favorite pieces. In the photo below, which Iain took, you can see the colored stripes a bit better than in my selfie. 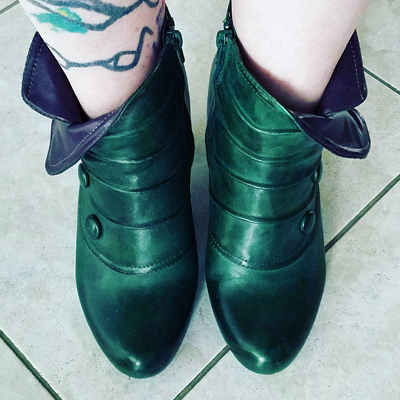 The colors of the Miz Mooz boots with which I paired the dress still aren't really visible in that shot, either, so below is a pic of just the boots. I adore the dress so much — and since I work at home, I will literally wear it anywhere, lol. In the past three weeks, I've worn it to dinner twice, to therapy, and to the gym! I have been on a major WEAR ALL THE COLORS kick lately, which I don't see ending anytime soon, and this dress has been absolutely perfect for my sudden mega-colorful phase. Anyway! As always, all subjects related to fat fashion are on topic, but if you want a topic for discussion: What do you wear when you want to feel bright and colorful, or is that how you always dress, or is that instinct completely foreign to you altogether?